Week 4 was an interesting confluence of things. I had been planning, for months, to travel to Muncie, Indiana for the four CIC Day at Ball State games. The Central Indiana Conference (and the Tri-Eastern Conference) have held, sporadically, a weekend of conference games at one Ball State. This year, Week 1 hosted the TEC Day, and Week 4 hosted the CIC Day. However, getting to Muncie for a 10am game meant either a real early morning drive OR heading over Friday night. Which meant finding a Friday night game close by. I originally planned, preliminarily, to see the Coldwater-Minster MAC game. However, it still seemed a bit too far of a drive. And instead, I started looking around Muncie. But, before I could commit to a Friday game. There was Thursday. Mercyhurst Prep v. Titusville, Canton Central Catholic (OH) v. St. Thomas Aquinas, St. Marys (WV) v. Ritchie County and the PIttsburgh City League’s Thursday game were all on the table. Having not visited CCC’s stadium before, it was an easy option. Even if calpreps was projecting the Crusaders as 50-0 favorites. But, along came the weather. A forecast of rain, wind, and thunderstorms for Maryland on Friday thanks to the impacts of Hurricane Florence meant the state, almost entirely, switched from Friday to Thursday. But, that’s a bit of a drive. So, Fort Hill was hosting Baltimore Lewis…. which was an even bigger blowout than CCC-STA. But, a 5pm kickoff on Thursday meant getting home at a decent time. But, then I started looking far west for whatever games I could find. Northern Garrett was hosting Clear Spring at 6:30 and Southern Garrett was hosting Catoctin at 6pm. Garrett County was the furthest west you could travel in the Maryland panhandle. After some quick research on Thursday morning, I decided Northern Garrett, located in the cleverly named town of Accident, would be where I’d set my sites. A three hour drive got me there about an hour before game time. It was a happy accident to discover that not only was the game in Accident, but that the stadium had one of the more unique names: Half Mile High Stadium. Clever. The game itself started off with two long drives resulting in no points for the first quarter. Despite Northern’s 27-6 prediction. Tickets for the game were only $4, with students cheaper. However, Northern Garrett’s offense slowly wore them down and put up four touchdowns. With both teams members of the MPSSAA’s 1A West, neither team is expecting much through the end of the season. But, on a rain-rescheduled Thursday night before a smaller than expected crowd, it was a fun night of football. Calpreps had the game at 27-6, while the Southern Garrett game was 21-20. That game ended 28-27. So, not bad for a computer algorithm. The problem with taking in a game in Maryland, was the 3-plus hour drive home combined with a 5-hour drive to Muncie the next day for a 7:30pm start. It wasn’t easy. Or that fun, either. But, after having figured out which Friday game to attend, I left about 1pm for the 300 mile trip. Delta High School, northeast of Muncie, was the destination. A school, essentially, surrounded by farmland made for a great setting. Delta High School had a strong booster club and rather vocal and sizable fan base. The student section was decked out with a USA-Red/White/Blue theme. The stadium was lively and you can tell the school puts a lot of effort into its athletics. The stadium was turf with full color endzones, midfield logo, all-weather track, and modern bathrooms–with a family room–and concessions. The bulk of the seating was reserve with two additional stands to the north and south of the main stand for more students and the band. The visiting Mount Vernon Marauders were from an hour away, brought a sizable chunk of the community. Delta jumped out to an early lead. On the strength of their ground game. Mount Vernon mounted a few threatening possessions, but fell behind and watched as the lead increased through the game. After the game, it was a short drive into Muncie for an overnight stay at the Days Inn and a whole day of football lined up for Saturday. The festivities started at 10am in a dense fog. Combined with the heavy cloud cover, the game started in a slight haze. But, as the weather heated up, so too did the offenses. Extending a 13-0 first quarter lead into a 41-26 halftime lead. From there, Alex (as their helmets said), tried to keep pace but could never make headway in reducing the deficit. Instead, we were treated to one of the highest scoring non-OT, non-6/8/9 man games I’ve attended. With the sun beating down on us, we retreated to the air-conditioned press box for most of the next two games. Despite the three-hour-plus first game, the second and third games were kept at a brisk pace. But the second game started off looking a lot like the first. The manic scoring pace wasn’t slowing down much. There was 187 points through six quarters of action. A staggering pace. Game three started between Mississinewa and Madison-Grant. Things started where we left off. Twenty-three seconds into the game. This game wasn’t expected to be close. And it wasn’t. At all. Mississinewa could have named the score. 70 seemed within range, but they held up and started subbing liberally late in the game, which included a long, clock-draining drive. And it ws already late enough for the last game of the day. With the sun going down, and feeling a bit better to hit the sidelines, it was on to game four. It was a very even, if somewhat sloppy, game between Frankton and Elwood. Through one half, Frankton held the slim lead, though it never seemed to be in question. Elwood was lucky to hold the Eagles to a redzone stop. But, the game started to get good after the third. Elwood scored to cut the lead in half. And then Frankton answered right back with a diving run up the middle. Elwood then went the length of the field to cut the lead again to seven, 22-15. But, the onside kick didn’t succeed, and Frankton was able to bleed the clock enough to put Elwood in a bind. Their last ditch efforts to win were fruitless and Frankton held on to win. Almost immediately after the game, the stadium killed the lights, much to the consternation of those still out on the field preparing to pack up and leave. Out came the cell phones dotting the turf to gather things and get on the road. I didn’t get a shot of that, as I had, luckily, already put away my camera and gotten ready to leave. After a day of football, it was the long five-hour drive home. While doable in theory, I called it a night about halfway home and drove the rest in the morning. My teenage self scoffs at that. But, I’m not about to drive tired and I had plenty of time to get home. For the weekend as a whole, it was fun. Getting to mark Maryland and Indiana off for this season. Seeing two ‘home stadiums’ as opposed to just events or places I’d already attended in the past. Northern Garrett was a fun drive, and Delta has a football gameday tradition that would stack up well with the best of PA or Ohio for schools their size. Having all four conference games at one location is an interesting setup. It does mean some one-sided games as a better team may be playing one of the weaker teams. But, it is a concept I’d like to see adopted elsewhere. Such as AAC or MVAC doing something at YSU, etc. 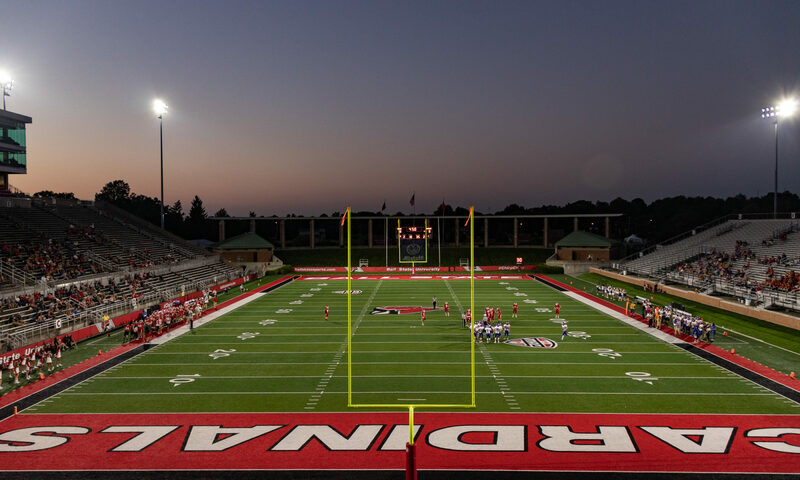 Shame that Ohio universities seem completely averse to hosting HS games yet in states not quite known for football nationally do so with regularity. Tickets, for those attending, were only $10 to stay and watch as long as you want. Four whole games. Concessions were a bit pricy being at a D1 college, but not the exorbitant cost of an NFL venue. $3 or $4 for drinks, while burgers, brats, nachos, etc were in the $4-$6 range. A drink and a Chik-Fil-A sandwich topped out at $10. For more pics of this week, go HERE.